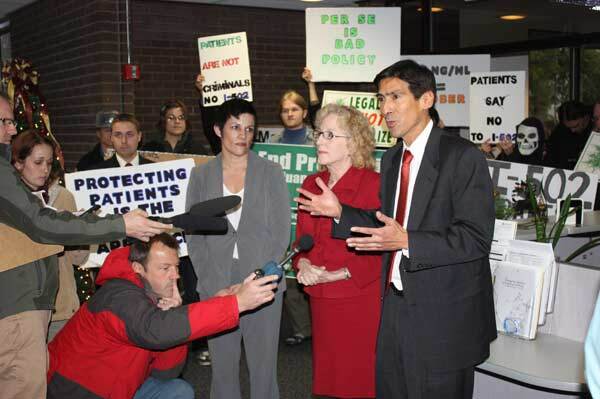 I-502 co-sponsor Salvador Mungia addresses the media while pro-502 campaign director Alison Holcomb (left) and Rep. Mary Lou Dickerson (middle) listen. I-502 opponents hold signs in the background. Sponsors of a marijuana initiative delivered what they say are roughly 341,000 signatures to our Elections Division, much more than a token effort. The initiative campaign plans to bring in 10,000 more signatures Friday, the deadline to submit signature petitions for initiatives to the Legislature. Initiative to the Legislature 502 would authorize the state Liquor Control Board to regulate and tax marijuana for those 21 and older. If passed by voters, I-502 would decriminalize production, possession, delivery, distribution and sale of marijuana in accordance with the provisions of the new law. Sponsors say it would generate at least $215 million a year in tax revenue, roughly $80 million for the state treasury, and the rest for research, health care and related purposes. The number of valid signatures of registered Washington voters that the I-502 sponsors say they turned in far exceeds the minimum of 241,153 required. The Elections Division recommends at least 320,000, to cover duplicate or invalid signatures. (The average error rate historically is 18 percent.) That number also allows for a speedier random sample method of verifying signatures. The Legislature has authorized the Secretary of State to establish, by rule, a random sample method to perform signature checks of initiatives and referenda. The standards used by the Secretary are based upon a mathematical algorithm devised by a mathematics professor at the University of Washington. Generally, a 3 percent random sample can be used when a ballot measure sponsor submits a total number of signatures that far exceeds the required minimum, meaning there is a very high reliability of this method. It’s likely that I-502 will undergo a 3 percent random sample instead of a full signature check. Now that the signatures have been delivered, they will go to our Archives Division to be “imaged.” Once that is done, a group of about 20 checkers will start reviewing signatures. The signature check process is slated to begin Jan. 9 and should take several days, Elections Division staffers say. If I-502 is certified, it will be submitted to the Legislature in the upcoming session. The Legislature must do one of three things with it: Pass it into law; ignore or reject it, sending it to the fall 2012 statewide ballot; or send it and a legislative alternative to the statewide ballot next fall. 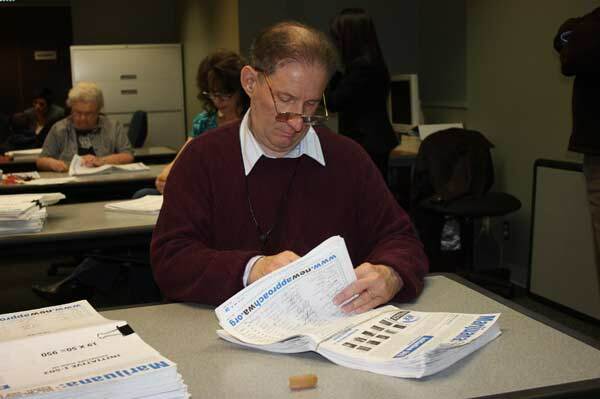 An Elections Division employee helps count the number of petition sheets that were delivered by I-502 sponsors.